More than one restoration option is available if you've lost your teeth. Dr. Stephen Harris, your Farmington, MI, dentist, offers several types of dentures for patients who need to replace missing teeth. Dentures don't just provide a cosmetic benefit, although a full set of teeth certainly enhances your appearance. The appliances also make it possible to chew foods, ensuring that you receive a variety of nutrients in your diet. Dentures also play an important role in clear speech, for without teeth, it's difficult to produce certain sounds or pronounce a full range of words. Full Dentures: Full dentures consist of a row of artificial teeth embedded in a pink base that resembles gum tissue. You receive the dentures after your mouth has fully healed following tooth extraction. The removable dentures are molded to fit the ridges in your gums for a comfortable fit. They're held in place with suction and denture adhesive and may be needed to be relined or rebased periodically. Immediate Dentures: You'll receive removable immediate dentures the minute any remaining teeth are pulled. A few weeks before your extraction appointment, your dentist will make an impression of your mouth that will be used to create your dentures. Immediate dentures ensure that you don't have to go through a toothless period. They also reduce bleeding and ease the transition to denture wear. Immediate dentures must eventually be relined or replaced with full dentures as your mouth heals. Partial Dentures: Partial dentures are a good option if you're missing several teeth in a row. The removable dentures hook over teeth on either side of the gap in your smile. 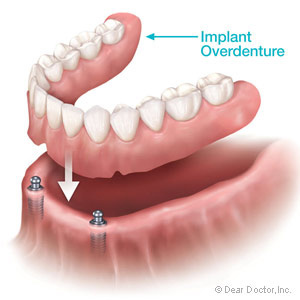 Overdentures: Overdentures are designed to fit over remnants of teeth. Although the teeth may no longer be whole, it's important to keep them if they have healthy roots. The roots will continue to stimulate your jawbone and keep it strong. Implant-supported Dentures: Implant-supported dentures are attached to dental implants placed in openings made in your jawbone. The implants bond to the jawbone and offer a secure foundation for your dentures. Each denture may require as few as four implants and may be attached directly to the implants or to a metal framework. Restore your smile with dentures! Call your Farmington, MI, dentist, Dr. Stephen Harris, at (248) 478-4755 to schedule an appointment.